Lynn Ripley's adopted name- one she had been known by since a small child- may have been appropriate, for her spell of stardom was all too brief. This pretty green eyed girl with long blonde hair emerged as a singer while still only fifteen, but by the time she was seventeen her career at the top was just about all over. The young singer/ songwriter had ridden to the #4 spot in the UK chart with what was thought in some quarters to be a scandalous recording. In fact, "Terry", -a record in the 'death genre'- was even banned by the guardians of public morality at the BBC. This gave the disc- a song which the 15 year-old Twinkle had written herself- an unmerited and unwarranted notoriety which doubtless helped boost its sales. In fact, "Terry" was the forerunner of a yet unheard single in the same tragic style by the American girl group, the Shangri Las, called 'Leader Of The Pack' which appeared a month or so later. The EP shown on the right is the frustratingly rare but highly sought after "A Lonely Singing Doll" on Decca DFE8621 . 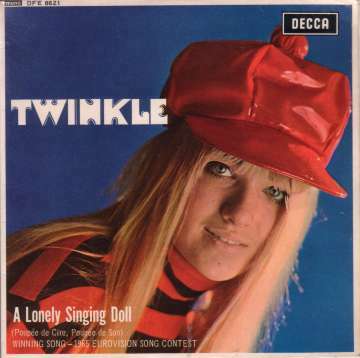 The EP's title song was Twinkle's version of "Poupée de cire, poupée de son"- the winner for 1965's entry to the Eurovision Song Contest for Luxembourg's France Gall. The UK entry for that year was "I Belong" by Kathy Kirby which managed a creditable second place. Twinkle followed up her big hit with the, arguably superior, song "Golden Lights"- another written by herself. This deserved to do better than the #21 position that it reached, but proved to be her last recording to enter the UK chart. Sadly, her following efforts were largely ignored and by the end of the 1960s she was all but forgotten. She did make some further recordings during the 1970s, in other guises which included 'Twinkle Ripley' and as part of 'Bill & Coo' (remarkably, "Coo" was Twinkle's father Sidney- leader of the Conservative opposition at the GLC). She also made a further assault on the chart with her remake of the old Monkees' favourite 'I'm A Believer' in 1982. However, knowledge of her existence probably rose to its highest point in the public conscience following the Smiths' remake of 'Golden Lights' during 1986. Incidentally, at least one other Ripley star has shone as brightly in the meantime. Twinkle's niece is none other than the actress Fay Ripley who is probably still best known for her portarayal of Jenny Gifford in the TV comedy/ drama "Cold Feet". Decca DFE8621 1965 "Lonely Singing Doll"